TAMPA – Stephanie Armenia is reading the children’s book she wrote about the important of recycling, and she hopes the story the kids are hearing will change their outlook. “Our generation now is much smarter, and we use to do environmental education in about the 4th or 5th grade. But now we are actually doing it in kindergarten, but we see that they value what they do. They are very aware,” Armenia said. 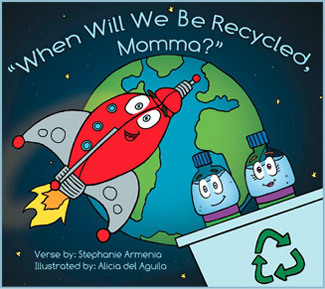 Stephanie’s inspiration for her story book, titled “When Will We Be Recycled Momma,” is her 8-year-old daugher Juliana, who brought home a dirty water bottle that she rescues from the trash. “That was the first time I made a connection between my actions, holding this little water bottle, that it has so much value and what happens when I throw it in the trash or I throw it in the recycle bin,” Stephanie said. Juliana’s determination sparked her mom to write the children’s book about the importance of recycling. “You can teach other kids how to recycle and they can do the same thing I did when I was little,” said Stephanie’s daughter Juliana. At 10 years old, Madeline Morris has already learned the lesson. “Like maybe soon, the whole planet will be, like, covered in trash, ’cause there’s nowhere else to dump the stuff. So I will recycle, so that it can be made into new things,” Madeline said. And Seely Bevan is looking beyond even how it can help the Tampa Bay area. “I think it’s very important. It affects the world and it affects even people around you,” Seely said. It’s an effect that the Armenia family is trying to change one child, and one bottle at a time. This entry was posted in News on January 1, 2012 by admin.